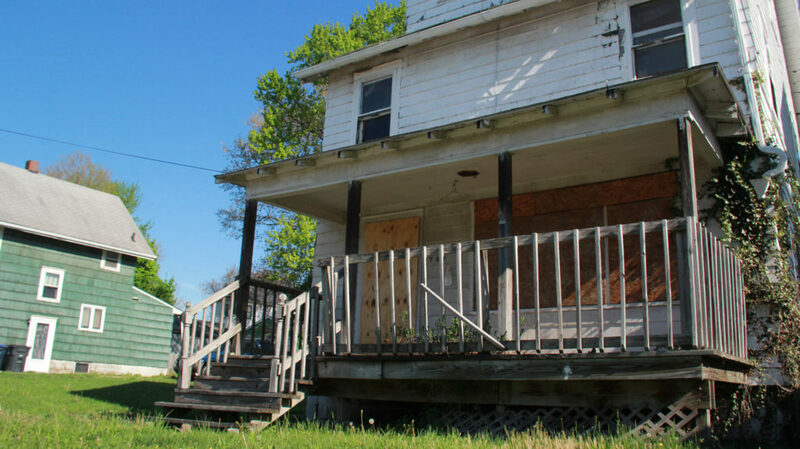 — It’s no secret that the neighborhoods surrounding the University of Akron have fallen into disrepair, with increased crime, vandalism, an alarmingly high numbers of vacant homes and yards literally being used as dumping grounds. However, the Neighborhood Network of University Park (NNUP) has brought about tremendous change using limited resources. And the efforts of this grassroots group will culminate with Neighborhood Reborn, Friday, June 17, which will bring in around 150 volunteers and approximately 15 local organizations to help make improvements to a targeted block behind Dave’s Supermarket: Excelsior and Roselawn avenues, to be exact. The work performed during this all-day event will include home repairs, landscaping work, reclaiming lots from newly demolished homes, new trees and an “artistic board-up” of abandoned homes, among other improvements. Like many grassroots projects in Akron, this one started out small and a number of people and community groups joined the fray. Thanks to this momentum, the collective will surely produce a high level of positive impact in this particular neighborhood, where hope seemed to be vacated long ago, like so many empty houses. On the funding side, NNUP will leverage a 2015 grant from Akron Community Foundation’s Decker Family Fund, along with $11,000 in funding from Habitat for Humanity of Summit County, and additional funding from United Way of Summit County, which will amass its volunteers for the agency’s annual Day of Action. The neighborhood collective will be joined by such groups as Habitat for Humanity, the city of Akron, Akron Police Department, Let’s Grow Akron, Mustard Seed Development Center, Summit County Land Bank, Keep Akron Beautiful, Dot Org Solutions, East Akron Neighborhood Development Corp. and a number of others (a full list is below). This vision is the result of years of work, a rebuilding effort from the ground level after the decline of a large nonprofit called University Park Alliance, whose houses could still be spotted among the many vacants throughout the University Park footprint. This particular block of houses reveals a level of neglect, but those residents who have remained still feel a sense of pride and hope. Among the 57 parcels in the project footprint, 10 owner-occupied households were asked which repairs they’d like to have done, so volunteers will perform these improvements within a budget of approximately $1,000. Some abandoned houses on these streets are prone to squatters. Other vacant homes have been set fire and extinguished by the local fire department for training, which is common practice for Akron houses on the demolition list. In other yards, people have dumped trash and old tires. During a recent visit, a stack of tires stood in the back of one of the yards. But volunteers hope that once this area is cleaned up, it will deter this behavior moving forward. Last year, an Akron Community Foundation grant was awarded to NNUP for the Cops on Porches program and for an artistic board-up, in which plywood boards are installed in windows of empty houses and images ranging from abstract art to silhouettes of common window sights are painted onto the boards. The group plans to paint the boards with silhouettes of lamps, pets and other functional items to at least give the passing appearance of activity within these vacant homes. Using the momentum of the artistic board-up, NNUP approached United Way, which agreed to channel its annual Day of Action event around this stretch of houses, making this project much larger in scope than intended. A key person at United Way was Andrea Metzler, who’s now with Dot Org Solutions. 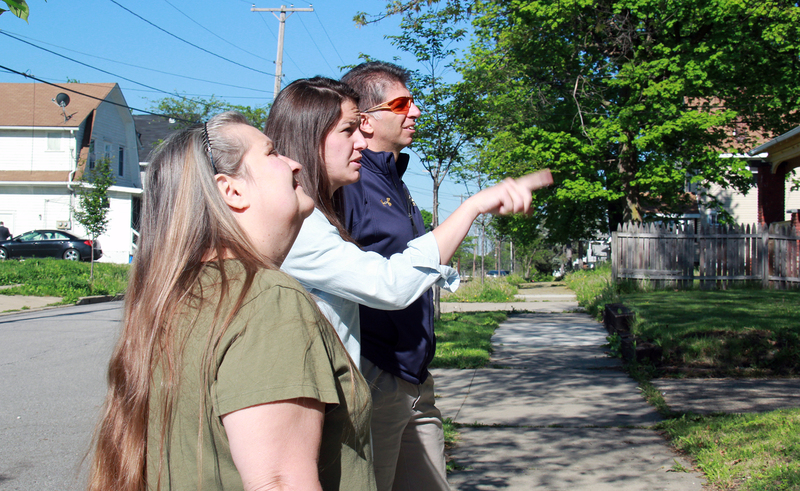 Once Blewitt started looking at which organizations would need to sign off on this project so volunteers could gain access to these empty houses, NNUP started picking up new partners, who also wanted to lend a hand in improving this neighborhood. 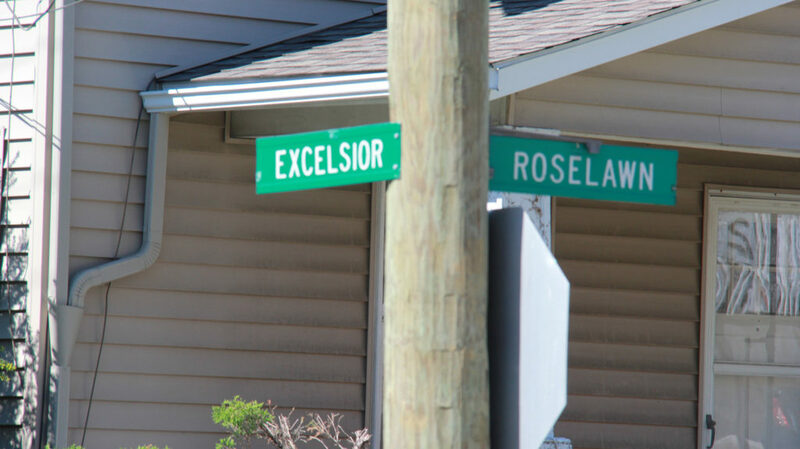 Partner Keep Akron Beautiful has planted 60 trees along these streets, and others helped expedite the demolition of at least five houses, no small feat considering some of these buildings are on the demolition list for up to five years. The Summit County Land Bank will enable residents to acquire neighboring empty lots through its Side Lot & Vacant Lot Transfer program. And Habitat for Humanity will help provide access to the houses scheduled for artistic board-up. Habitat also will lend its volunteers for “sweat equity,” a way for homeowner families to tally volunteer hours. 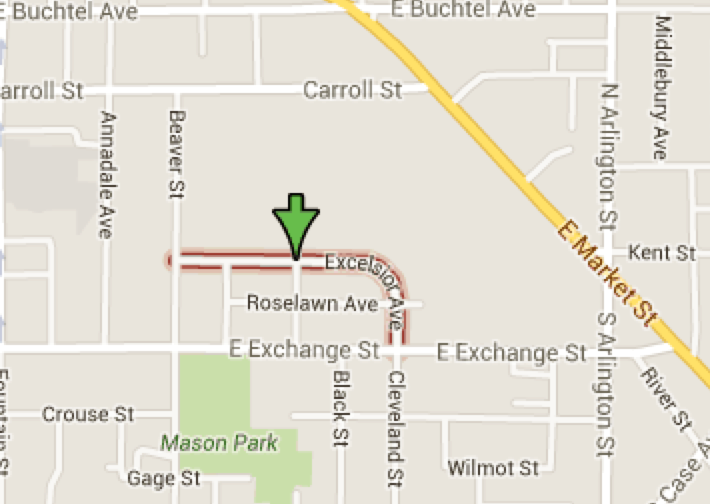 Mustard Seed Development Corp. also has a stake in this neighborhood, as it has a model home on Roselawn Avenue. Along with providing funding and a small army of volunteers, United Way of Summit County also will provide breakfast and lunch the day of the event. One of the parcels has been eyed for a community garden. Another goal will be to evacuate some of these abandoned homes of critters, which is a frequent problem for residents. NNUP volunteers realize that there is still a lot of ground to cover, as only 57 percent of structures in University Park are occupied, among the lowest rates in the city. 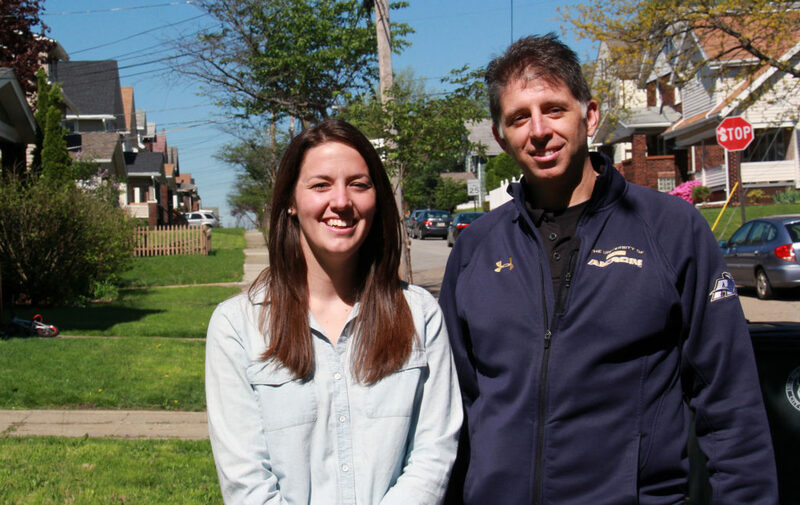 As an employee of the University of Akron, Green says it became difficult to recommend to students these houses so close to campus. “How do you let houses this close to campus decay?” he asks. He’s hoping that once these lots being used as ersatz dumping grounds are cleaned up, it will encourage neighbors and visitors to keep them clean. And residents plan to continue working on this neighborhood beyond the June 17 event. A Middlebury Better Block is scheduled for July 30 and 31.